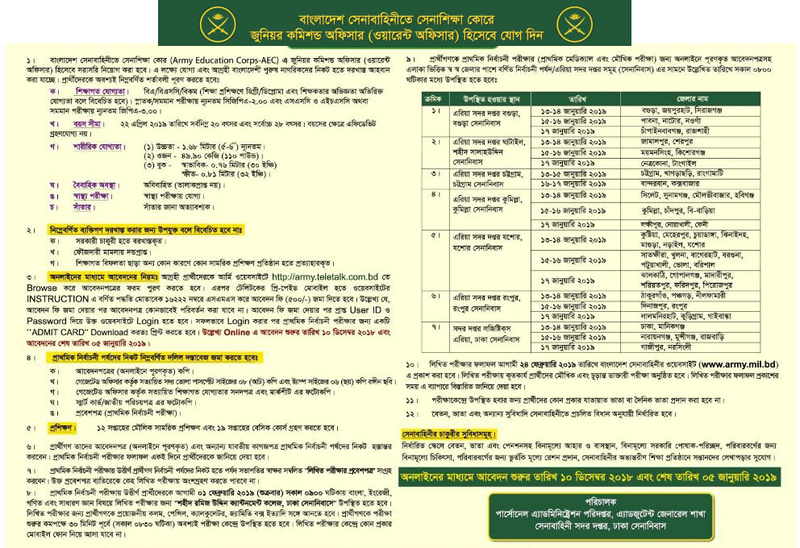 Bangladesh Army Junior commissioned Officer job circular 2019 (Warrant Officer). BD Army education corps Junior Commissioned Officer / Warrant Officer recruitment advertisement has published on Prothom Alo newspaper and their official website at www.army.mil.bd. The interested and eligible candidate may apply by 10 December to 5th January 2019. Online application www army teletalk com bd. Bellow, you have to see the details. Bangladesh Army Education Corps- AEC directly recruit some Junior Commissioned Officer / Warrant Officer. For that online applications are invited from original Bangladeshi candidates through www army teletalk com bd. Education Qualification: BA/ BSc, BCom (Degree for Education training, Diploma and teaching profession candidates are preferable). Minimum cGPA 2.00 in Bachelor degree and GPA 3.00 in SSC and HSC. Age limit: Candidates age limit must 20-28 years up to 5th January 2019. Interested and eligible candidates must apply through www joinbangladesharmy mil bd or www army teletalk com bd. Fill the application form. And pay the application fee 500 Taka by Teletalk. Fee payment instruction (SMS system) are available on the advertisement. After payment candidates will get User ID and Password. Then must download the “Admit Card” for the written exam. Candidates must download Admit Card for the written exam, viva, and medical test. Marksheet and all educational certificate photocopy. Besides, when and which time candidates will present for primary selection, everything you will able to see the advertisement. You can also download the admit card above link. Bangladesh Army Junior Commissioned Officer Job circular 2019 (Warrant Officer) Admit Card and written exam result will publish on this page. So keep visiting this page for next update. BD Army warrant officer written exam result, BD Army Junior Commissioned Officier exam result 2019 via www army teletalk com bd. Bangladesh Army Commissioned (Warrant Officer) Job Circular 2019. Bangladesh Army Education Corps – AEC Junior Commissioned officer (Warrant Officer) new job circular. Interested and eligible candidates are invited to apply by 10 December to 5th January 2019 by online at www.army.teletalk.com.bd. Bellow you have to see the details about this Army Commissioned job circular. Interested and eligible candidates must apply through online www.army.teletalk.com.bd. And fill the application form by 5th January 2019. After submit the application just send the fee by Teletalk SMS. Application fee is 500 Taka. Here is mention that after payment application fee you could not change the application information at all. After completed everything you will get an User ID and Password. Just login and download admit card for primary selection exam. Written exam result will publish on 24th February 2019. Primary selected candidates will seat for the written exam on 09:00 AM on 1st February 2019 about Bangla, English, Mathematics and General Knowledge at Shohid Ramij Uddin Cantonment College, Dhaka. bangladesh army jobs juniur commission. bangladesh army warrant officer circular. jco circular bd army. junior commissioned officer circular 2017. bangladesh army junior commissioned officer circular 2017. www army mil bd teletalk com. Bangladesh army Junior commission officer job circular. bangladesh army junior commissioned officer. bangladesh army teletalk com bd. teletalk army education core. army teletalk. army warrant officer carcular. bangladesh armey bmi offecer job need paoint. Armyteletalk. army warrant officer job circular 2019. army officer circular. army Junior Commission circular 2019. army job circular 2019. army com bd. army circular of commission rank. Amar honours result published. But ami certificate akono pai nai. Ami ki mark sheet diea kag korete parbo? Madrasha theke Fazil passed, apply korte parbo ki?